A synthetic peptide, corresponding to residues in Human Bmi1 (UniProt P35226). WB: K562, SAOS-2, SW480, MOLT4, PC-12 and HT1080 cell lysates. IHC-P: Human tonsil, colonic adenocarcinoma, lung adenocarcinoma, breast carcinoma and thyroid gland carcinoma tissues. ICC/IF: SW480 and HeLa cells. Mouse: Internal data indicated that the antibody is not suitable for WB application in mouse species. Our Abpromise guarantee covers the use of ab216444 in the following tested applications. WB Use at an assay dependent concentration. Detects a band of approximately 40 kDa (predicted molecular weight: 36 kDa). 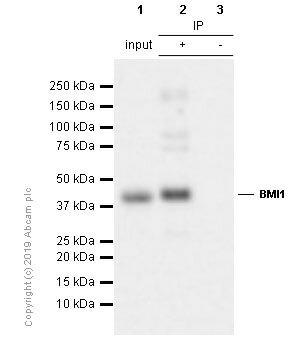 ab197620 was shown to recognize Bmi1 in wild-type HAP1 cells as signal was lost at the expected MW in COMMD3-BMI1 knockout cells. Additional cross-reactive bands were observed in the wild-type and knockout cells. Wild-type and COMMD3-BMI1 knockout samples were subjected to SDS-PAGE. Ab197620 and ab130007 (Mouse anti-Vinculin loading control) were incubated overnight at 4°C at 1/1000 dilution and 1/20000 dilution respectively. The loading control was imaged using the Licor Odyssey CLx prior to blots being developed with ECL technique. This data was developed using the same antibody clone in a different buffer formulation containing PBS, BSA, glycerol, and sodium azide (ab197620). Immunohistochemistry (Formalin/PFA-fixed paraffin-embedded sections) analysis of human breast carcinoma tissue labelling Bmi1 with purified ab126783 at 1/500. Heat mediated antigen retrieval was performed using Tris/EDTA buffer pH 9. ab97051, a HRP-conjugated goat anti-rabbit IgG (H+L) was used as the secondary antibody (1/500). Negative control using PBS instead of primary antibody. Counterstained with hematoxylin. This data was developed using the same antibody clone in a different buffer formulation containing PBS, BSA, glycerol, and sodium azide (ab126783). Immunocytochemistry/Immunofluorescence analysis of HeLa cells labelling Bmi1 with purified ab126783 at 1/500. Cells were fixed with 4% paraformaldehyde and permeabilized with 0.1% Triton X-100. ab150077, an Alexa Fluor® 488-conjugated goat anti-rabbit IgG (1/500) was used as the secondary antibody. DAPI (blue) was used as the nuclear counterstain. ab7291, a mouse anti-tubulin (1/1000) and ab150120, an Alexa Fluor® 594-conjugated goat anti-mouse IgG (1/500) were also used. Control 1: primary antibody (1/500) and secondary antibody, ab150120, an Alexa Fluor® 594-conjugated goat anti-mouse IgG (1/500). ab126783 (purified) at 1/500 immunoprecipitating Bmi1 in 10 μg K-562 (Human chronic myelogenous leukemia lymphoblast) whole cell lysate (Lanes 1 and 2, observed at 43 kDa). Lane 3 - Rabbit monoclonal IgG (ab172730) instead of ab126783 in K-562 whole cell lysate. For western blotting, HRP Veriblot for IP (ab131366) was used as the secondary antibody (1/1000). Immunocytochemistry/Immunofluorescence analysis of SW480 cells labelling Bmi1 with unpurified ab126783 at a dilution of 1/100. Immunohistochemistry (Formalin/PFA-fixed paraffin-embedded sections) analysis of human normal tonsil tissue labelling Bmi1 with unpurifiied ab126783. Immunohistochemistry (Formalin/PFA-fixed paraffin-embedded sections) analysis of human colonic adenocarcinoma tissue labelling Bmi1 with unpurifiied ab126783. Immunohistochemistry (Formalin/PFA-fixed paraffin-embedded sections) analysis of human lung adenocarcinoma tissue labelling Bmi1 with unpurifiied ab126783. Immunohistochemistry (Formalin/PFA-fixed paraffin-embedded sections) analysis of human thyroid gland carcinoma tissue labelling Bmi1 with unpurifiied ab126783. Publishing research using ab216444? Please let us know so that we can cite the reference in this datasheet. There are currently no Customer reviews or Questions for ab216444.